One of the largest and most elaborate festival gatherings on the planet welcomes electronic music fans back to rural Georgia for a second year, and a truly unique experience unrivaled by any other. TomorrowWorld is an annual 3-day music festival held during the last weekend of September located on the beautiful Bouckaert’s Farm in Chattahoochee Hills, Georgia, just 25 miles southwest of Atlanta. The weekend of September 26-28, 2014 marked the event’s second year in the States, and a record attendance of nearly 160,000 visitors spanning 75 countries. Electronic music fans from across the globe ascend on festival grounds for the event’s innovative and immersive experiences, incredible décor and production value, exclusive 5-day camping and VIP treatment, but more importantly, an impressive lineup of today’s most popular DJs performing around the clock. Hundreds of artists from the electronic dance music scene performed among seven extraordinary and uniquely designed stages throughout the festival. The main stage for 2014, appropriately named the ‘Volcano Stage’, spanned over 400 feet wide and 100 feet tall, included computerized pyrotechnics, waterfalls, and a volcano that would erupt sporadically throughout the event. As most of the equipment and staging setup for the festival were developed in Belgium, more than 80 shipping containers were loaded up and shipped across the Atlantic to the festival site. With the scale of the production and staging reaching new heights, of course, the lineup had to live up to all the hype as well. Once again, festival organizers were able to curate an incredible lineup, booking some of the top names in the world of EDM. Some of the headlining artists for 2014 included Aviccii, Bassnectar, David Guetta, Dimitri Vegas and Like Mike, Diplo, Kaskade, Martin Garrix, Nickey Romero, Richie Hawtin, Skirllex, Steve Aoki, Tiesto, Zedd, and many more. 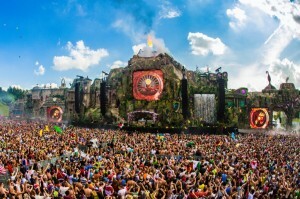 TomorrowWorld 2013 was the first European festival of its scale in the United States, and the first to set a minimum age of 21 for its ticket buyers. 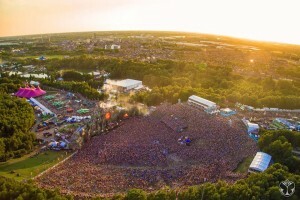 The festival was created as the international edition of Tomorrowland – the largest electronic music festival in the world, which began in Boom, Belgium during the summer of 2005, and continues to be held there annually. 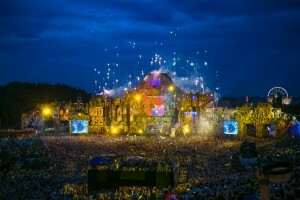 TomorrowWorld was nominated as Best Festival Worldwide by the International Dance Music Awards (IDMA) in 2014, and Tomorrowland won six “Best” awards in 2012 including “Best Music Event Worldwide” at the IDMA (2011-2012-2013) and “Best Major European Festival” in 2012.